Brexit: Can Theresa May seal the deal with Tory critics? Understandably, Westminster is frothy with gossip tonight. Is the government about to lose control completely of the Brexit process? Not quite. Is there an obvious way for Parliament out of this mess if it gets the chance to test it properly? Not quite. How likely is it that a handful of ministers might resign tonight to help that theoretical process? Quite likely. Is the prime minister about to get the DUP on board for her deal? Not quite. But the biggest question is, as it always has been. Is Theresa May about to seal the deal with the Brexiteers whose votes she so desperately needs? Well, not quite. 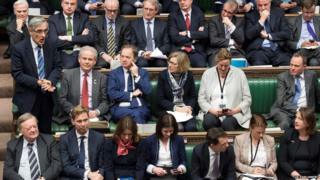 This morning, there were some in government who were hopeful that the mood was suddenly turning and there might, in fact, be the numbers emerging for the prime minister to hold another vote on her deal with the EU in the Commons on Tuesday. One Cabinet minister confidently predicted it to their team this morning. Another insider was astonished to find the mood so changed in Number 10 when they got to work this morning. But the gaggle of influential Brexiteers who had their day out at Chequers on Sunday had another meeting in the first half of the day today while rumours were doing the rounds about the third vote. Iain Duncan Smith, Boris Johnson, Steve Baker, Dominic Raab and other key Brexiteers chewed over whether, after yesterday's meeting at the PM's country pad, they could move to back the deal after all. One source present said no conclusion was reached. There are no firm commitments, and no obligations. The group could end up taking a collective decision to back Theresa May, or quite possibly not. For Johnson and Raab, both potential leadership contenders conscious they may face off against each other in a contest someday soon, there is an added calculation - how would the decision they make be viewed by Tory members who will have the decisive power when the time comes to choose the next Tory leader? Do the two men jump together? Or not at all, hoping to please the mainly Brexiteer base of the Conservative Party. The meeting today didn't come to a concrete decision about whether or not the MPs present will ever back the prime minister's deal. But it's understood they discussed not just whether the prime minister should promise to quit in return for votes, but the need for her to make such a promise publicly, because there is "such a problem of trust". And with no firm conclusion from this series of conversations, which one senior MP involved described as fluid as a "set of amoebas", there is no solid support the prime minister can rely on to put her vote again. Signals tonight from a huge meeting of the European Research Group suggested, as he has before, that the chairman Jacob Rees-Mogg might come on board for the deal if the DUP budge. But that's still far from a certainty. Until that shifts, which is still - if remotely - possible this week, don't expect ministers to be able to put their deal to the test for a third time.